2014 feels like the year of Multiplayer games, with releases like Need for Speed Rival, Respawn’s Titanfall and Bungie’s Sci-Fi epic Destiny all forgoing an enriching single-player experience for a multiplayer experience. Evolve is no different, however that might not be a bad thing. 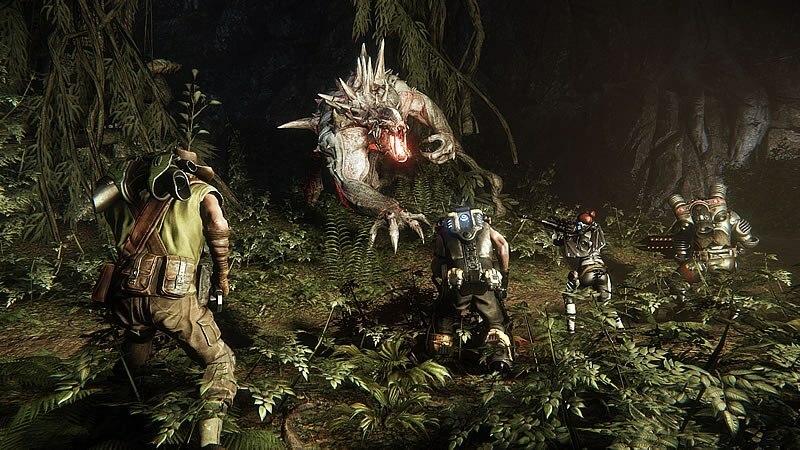 Evolve is the latest game from Turtle Rock, the original developers of the Left 4 Dead and the L4D DNA was immediately apparent; everything from the overarching theme of survival to the emphasis on teamwork, Evolve seemed like a natural evolution (pun intended) from L4D. The premise of Evolve is simple; 4 human hunters must work together to hunt a certain player controller monster while the monster would need to feed on the local flora and fauna to grow and evolve until it's finally strong enough to go toe to toe with the hunters. Players would be split into 2 different factions, each with its own objectives. A single player would take on the role of the monster with a designated objective albeit after evolving to its final form; for my playthrough, I was tasked with the destruction of a generator and its staff of scientist. The remaining 4 players would play the role of the hunters with the sole purpose of killing the monster. There are 4 available classes to the hunters (Assault, Medic, Support and Trapper) all of whom fill the traditional Shooter archetypes, however the shortcomings and strengths of each class makes them indispensable to each other. No single class is able to clearly damage the monster significantly enough to render itself more or less useful than each other. Despite the limited selection of classes, I was told that each character from the same class would play differently from each other however the build that I played only had 1 character per class. First off there is Markov from the Assault class, which is basically the big guy with the big gun. Armed with a high powered automatic rifle and a rifle that literally spits bolts of white hot lighting down range. The Assault class can also lay down mines and finally he’s also able to activate a temporary personal shield when everything goes south. He is by far the simplest class to play because of his high damage output however a big guy with a big gun makes for a juicy target. Next comes Hank from the Support class, he comes equipped with a Laser Cutter which fires a stream of red hot laser in a straight line, a shield gun that protects a single teammate with temporary shield as long as he’s in range or when the fire button is held down and finally he is able to bathe an area in fire by calling in a orbital bombardment (excellent for those pesky monster infestations). Despite not having 2 damage dealing weapons, the support class more than makes up for it by having the single most damaging ability in the game: the Orbital Strike. However he is also essential to the team’s survival as skilled use of his shield gun could mean the death or survival for his dying team mate. The Trapper is a class unique to Evolve, Hank is armed with a harpoon gun which greatly slows the monster if it hits home however the monster would be able to free himself if the cord is cut – the ability synergizes well with Hank’s Orbital Bombardment. He’s also able to plant sound spikes around the map that would alert the hunters if the monster in its vicinity and finally he’s able to deploy a mobile arena that would trap the monster in a dome with the hunters (think Jarvan’s ultimate in LoL). And finally we have Val the Medic, she packs a medgun that allows her to heal a single ally or she can use her healing burst ability to heal her ally within a small radius. Just because she’s a medic doesn’t mean she is unable to hold her own during combat, Val packs an anti-material rifle which would puncture holes into the monster’s thick hide, which her team mates would be able to shoot through for extra damage. She also packs a tranquilizer rifle which would slow and weaken the monster for a limited time. Last but not least there’s the monster, however the only monster I was able to play as was the Goliath, a bipedal monstrosity with sharp claws, immense strength and capable of leaping great distances – oh and it’s able to breathe fire. I was assured by 2K that the Goliath will be but just 1 of the many monsters that would be featured in the final game. Unlike the Hunters, the monster would only be able to pick 2 out of 4 abilities available to you however each evolution would allow you to pick additional abilities. In its infant form, the monster is pretty darn weak in terms of durability and damage output. Luckily, you’ll have a small head start before the hunters spawn so you'd better use it to put some distance between you and the hunters. As the monster kill and eat the animals inhabiting the environment, it would fill up an evolution meter. The stronger the animal, the faster the monster would evolve; once the meter is filled up, the monster would need to find a spot for it to enter a cocoon and begin evolving however the monster would be vulnerable to the Hunter's weapons during this state. The monster would also grow in size and overall power with each evolution. The momentum of the game shifts from hunter to monster as the weak human sized monster you’ve been hunting from the start have since evolved into a hulking fire breathing monstrosity. It is not to say that the monster would stand no chance in its lower forms of Evolution, I managed to wipe 3 hunters by luring them into a lake which a giant man/monster eating animal called home. As a monster, you would need to use your surrounding environment as a weapon. Evolve was everything we loved about L4D and the Zerg race in general and tossed them into a salad bowl of intense multiplayer action which left me in awe. Evolve really felt like a natural EVOLUTION.